At the age of sixteen, all teenagers are required to undergo aptitude testing and choose the faction that they will belong to for the rest of their lives. For Tris, the decision may mean leaving her family behind, if she decides not to join them in the selfless community of the Abnegation faction. Such choices, however, are only the beginning, as the world around Tris begins to rapidly unravel. I loved this book. Loved it. I read a few pages over a couple of days, and then sat down and read the majority of its 487 pages in one afternoon, enjoying every moment of it. Divervent hits so many of my happy buttons. Dystopia, personality-based groupings, coming-of-age stories, heroic actions and deaths… this book was essentially written to be just my kind of thing. Because of that, I’m going to struggle to review it properly. Right now, I mostly just want to rave about the fact that I’ve not been this excited by groupings since Harry Potter. The Abnegation, Amity, Candor, Dauntless and Erudite factions are what make Divergent great, and I think that, through them, Veronica Roth has created a universe that will stick with people long after the plot of her trilogy has become a little fuzzied by time. I also really enjoy Tris as a protagonist. It is so refreshing to read about a character who is great because of who she is, rather than how she looks. She’s not pretty, she doesn’t look Dauntless-strong and yet she is always presented as having something to offer and as being a girl that people can fall for. 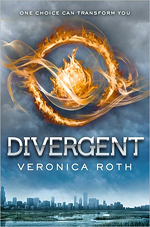 As much as it is a book about increasing tension between factions, Divergent is a book about Tris’s personal growth. She is far from perfect and far from confident in her own abilities, but she grows a great deal over the course of the novel and will hopefully continue to do so in the other two books in this trilogy. Certainly, the events of the closing chapters would suggest so. I also appreciated the slow development of the romance in Divergent and the fact that it is not represented as being the most important part of the story. It feels like the romance is based on common backgrounds and values, not the usual fated attraction or interest based almost entirely on infeasibly perfect appearances. Again – very refreshing. The supporting characters are all wonderfully developed as well. Christina’s bold and tactless personality is a great counter to Tris’s self doubt and Abnegation upbringing. Four is just the right about of mysterious and always intriguing. Will steadily grew on me as the book progressed and Al is heartbreakingly complex. Tris’s family are all great in different ways and by Jove there are two scenes in the book that will stay with me for a while. The villains are good too. A little too villainous at times, perhaps, so I’m hoping that we get a bit more character development with them in the upcoming books, so that they’re a little more three-dimensional.